Complete our online Contact form, email us at info@ranebrook.co.uk or call us on 01322 332237 to discuss how we can help you with the service required and book an appointment. How quickly will you get back to me once I’ve sent in a request for a quote? We aim to return to you with a quote within 24 hours, providing that your enquiry is for a standard product that can be seen on our website. For more bespoke enquiries, please expect up to 3 working days. Could I get some prices quoted over the phone? Yes, we provide quick quotations over the phone for enquiries of one/two standard specification windows. However, please bear in mind that verbal communications can be misinterpreted and so it is better that you have your request emailed over. Our sales assistant will take down your details and request and get back to you with your quote in writing. Also, any prices provided via email have a guarantee of 30 days, verbal quotes are estimates only and will not be guaranteed if you decide to contact us again. We usually work to a 6 week lead time (give or take a couple of days) from the day an order is placed to order delivery. During busier times of the year, this can go up to 7 weeks, but we will keep you informed before you place your order. We operate a nationwide service and will never turn down enquiries from the whole of the UK. But as our office is located in Erith, we attract enquiries from local areas. For this reason, we would ask that you call us on 01322 332237 or use our contact page and we will still be happy to provide a free no-obligation quote. We do not currently have a showroom (this allows us to offer you very competitive prices and work to your budget! ), however, we welcome you to meet us to see our products that we keep in our storage units. This is by appointment only so just give us a quick call or drop us an email, we are very flexible with meeting times. If you are in our area, we can also drop by with some sample windows, so that you can see the amazing quality in person! What is the order process and the payment that you require? When placing an order, we ask for a 50% pre-payment and for a contract to be signed (this can be sent back by email or post). Once we have received your pre-payment and signed contract, your order will be placed. The final payment is then to be made before or during the delivery of your products. Please note that for larger projects exceptions can apply. All terms will be made clear when you are ready to place your order. We accept bank transfer and all major credit cards (for smaller orders). Unfortunately, we don’t offer any finance arrangements. During delivery of my products, who is responsible for offloading the goods? It is your responsibility as the customer to offload your doors/windows from the van/truck. We will advise you on how many people you may need, according to the sizes and weight of the products, as well as instruction on whether a forklift is necessary. Do you offer a warantee? Yes, all our work is guaranteed for 5 years. Can you repair my windows? We do not offer a window repairing service. 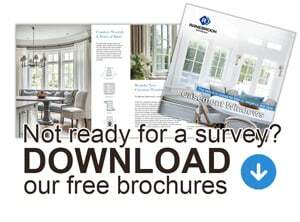 For supply & fit orders, will you install the windows as soon as they are ready? Most of the time, yes. Once your 6 weeks wait is over and your products are ready, our trusted fitters will deliver and begin installation the same day. We will work with you on arranging the date, and in the rare occasion that there are delays, we will inform you before your windows/doors have been completed. We use only approved sub-contractors that have worked with us for years and have proved to our customers time and time again that their professional skills are unmatched. The fitting team chosen to fit your new windows will ensure that the property is protected by dust sheets and after completing the work will leave each room as tidy as he found it. Installation length varies depending on the requirement of the service and the number of windows/doors which need to be worked on. We can, however, give accurate information and timescales after the initial survey. Will I need to be at home during installation? It is not necessary for you to be present as long as we have access to the property. Our company liability insurance will cover your home and contents whilst we carry out the work. How should I prepare for a trouble free installation? We strongly advise the working space is clear and anything around the window is removed prior to our arrival, including blinds, curtains and shutters. Alternatively, we can try to remove the existing shutters and/or curtains but cannot be held responsible for any damage that may occur during this process, or guarantee the shutters/curtains will fit if a new box frame or casement frame is fitted. Where possible we do all work in situ and take the sashes out from the inside of the property. Because of this, we ask that the rooms we will be working in are cleared, and we will dust sheet all furnishings. If scaffolding is necessary, i.e. there is limited access or for larger commercial projects, then we would always discuss this with you in advance of the order being placed. Do the windows and doors you supply satisfy Building Regulations? All the sash windows, casement windows and doors that we supply are fully compliant with current Building Regulations. Listed buildings and conservation area properties may be exempt from regulations – your local planning authority will be able to advise you if you are unsure. The new windows we fit, the wooden frames are treated with a wet rot, dry rot and woodworm preservative before being sprayed with primer and 3 coats of microporous paint. What is the difference between a box sash window and a spiral/spring balance sash window? A box sash window operates on a traditional cords & weights system. The cords & weights are encased in boxes in the sides of the frame. They are installed so that these boxes hide behind the brickwork. Spiral/spring balance sash windows operate on springs, eliminating the needs for additional boxes on the frame. As a standard, we offer our softwood option of Engineered Pine, but we can also offer you Meranti or Oak, which are our hardwood choices. You don’t have the ironmongery that I want. Could you supply something different than your shown choices? You are welcome to send us links of the ironmongery that you prefer. As long as they fit the window/door profile and the locking mechanisms, we can purchase these separately and add them to your quote. We will not charge extra for the fitting of these. Alternatively, you are welcome to purchase these yourself and send them in to us. Please make sure you mention this before finalising your quote. Do you offer self-cleaning glass? Yes, this is one of our glazing options. However, we cannot guarantee the effects of this as it is a fairly new option on the glazing market. Can I re-paint the products you have supplied me with? You can, although this is not recommended unless it’s necessary. Modifying your windows/doors will invalidate your warranty, and you will not be able to achieve the original factory finish quality. We have a wide range of many colour options to choose from, so please make sure you enquire so that we can provide you with your desired options. Do you offer products in aluminium or UPVC? We are currently in the processes of refining the details for these options, therefore, they are not yet shown on our website. If you have an enquiry about windows/doors made in these materials, just contact us and we will get back to you with more details and a free quote.